From the late 60’s, timber gridshells have fascinated architects and engineers alike with their ability to cover large spaces with minimum material, expense and environmental impact. However, with long-term creep deformations, thin cross sections and high elasticity, timber shells face potential stability issues. Historically, prestressing systems have been shown to prevent instability modes in unstable structures. This thesis explores the potential use of prestressing in timber structures through the design of a lecture pavilion. The purpose is both to investigate the possible benefits of prestressing and to evaluate constructive design research as a method for driving structural engineering research. This is done through an iterative design process exploring, evaluating and further developing possible concepts into a viable design proposal. 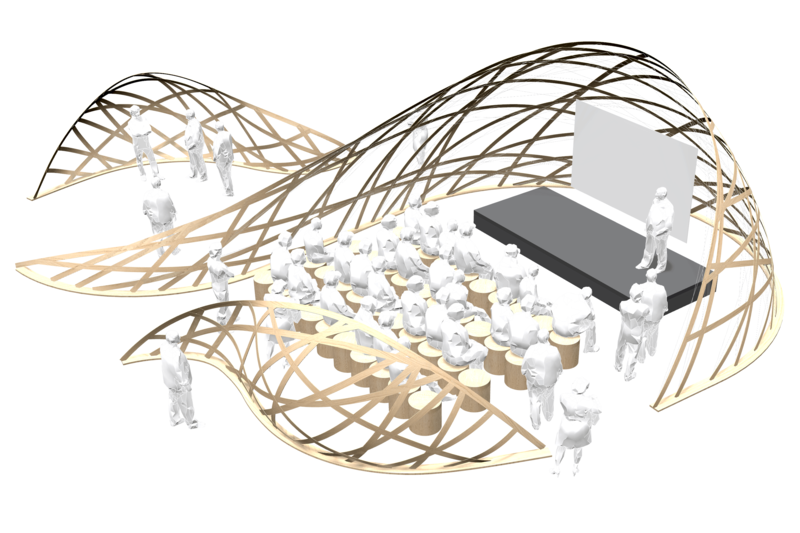 Based on context, production and relevance for the research question an actively bent geodesic gridshell is chosen as the most suitable concept at the end of the conceptual design phase. Digital analysis and physical tests are then interactively combined to study and implement various modelling and analysis techniques, prestress configurations and connection details. It is found that an internal prestressing system can significantly increase the stability of elastic bending-active gridshells in terms of eigenfrequencies. Reflections on the constructive design research approach suggest that it is a useful method for exploring new structural concepts. There is also a discussion on the level of openness in the design question and the resulting consequences for the design.